WASHINGTON — Republican Sen. Pat Toomey on Sunday said he’s hopeful his gun background check legislation could be revived in Congress, but he has received no new firm commitments of support from his colleagues or commitments for a vote from Senate leadership. Toomey was the Republican leader of the bipartisan push for gun reform after the Sandy Hook Elementary School shooting in Newtown, Connecticut. In 2013, he and Sen. Joe Manchin, D-W.V., pushed a bill, known as “Manchin-Toomey,” that would have expanded firearm background checks to online sales and gun shows, but the measure couldn’t get through the Senate’s 60-vote threshold. It failed to move forward by a vote of 54-46. The legislation was brought up for a vote again in 2015 after the mass shooting in San Bernardino, California, but actually lost support, failing by a vote of 48-50. "I certainly hope we can succeed with another run at it," Toomey said. Sen. Amy Klobuchar, D-Minn., is optimistic that Manchin-Toomey could pass if it came up again. "When I had those Sandy Hook parents in my office, and they told their stories, and you think about the courage they had to come forward on a simple background check bill, and then the Congress didn’t have the courage to pass it, I don’t think you’re going to see that happen again," she said on Sunday's "Meet The Press." "I want to see Senator Toomey’s bill come up for a vote, I’d like to see an assault weapon ban come up for a vote." Republican Rep. Thomas Massie of Kentucky, meanwhile, called proposals like those to expand background checks "false senses of security." "In ten years, we're still going to have school shootings, unless you propose real legislation, like President Trump has proposed, that would allow teachers to be armed," he said. Toomey on Sunday also suggested that he'd be open to discussions about temporary restraining orders on guns for people with evidence of dangerous behavior, but that there would have to be appropriate due process involved. He also didn't believe expulsion from school should necessarily be enough to warrant an extra look in a gun background check, and he was unsure about Trump's suggestion to raise the age for purchasing an assault weapon. 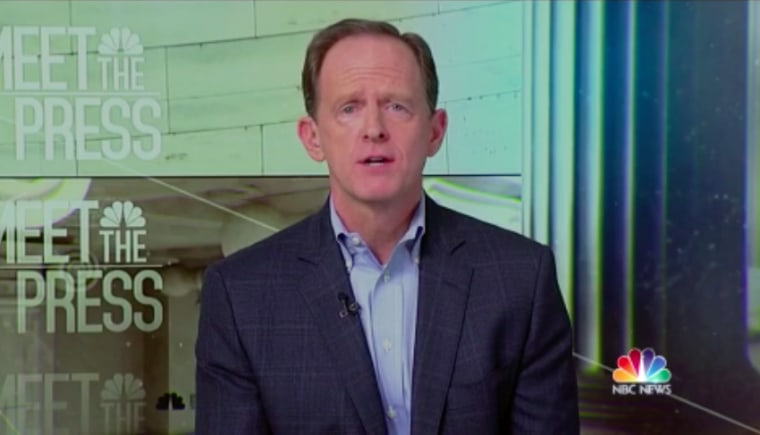 Toomey also said he'd be open to having teachers armed in schools "under some circumstances," but that the decision should be left to the individual school districts and the states. Even with his new push to expand background checks, Toomey did acknowledge that he doesn’t think passing his legislation would have necessarily prevented shootings like the one in Parkland, Florida, that revived the nationwide gun debate. Manchin-Toomey was “not going to solve all problems, and we never suggested that it would,” he said.